We are a Boss Snow Plow Dealer! We can get plows and pushers for Loaders, ATV's, PARTS and more! Armory Rd location has plenty of material to offer. 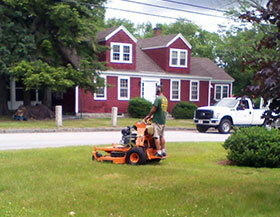 Call and ask what we have for your landscaping and gardening needs. Elm st. location has much to offer for equiptment large and small. Our employees will be happy to go over the equipment with the customer at the time of rental. Let Balcom Brothers help you with all your outdoor needs. After being in business for over 30 years, Balcom Brothers remain a family run operation. Each year we continue to grow, and so does our inventory of equipment that's available to you. We strive to offer quality service and a friendly, knowledgeable staff. Our landscape supply yard carries bark much, stone, crushed gravel, and loam, as well as decorative stone and everything else you could need to create a beautiful patio or garden wall. Our rental store has everything you’ll need to get your home project done right. Do you need to dig a trench or compact a walkway? Or what about shampoo a carpet or steam off some old wallpaper? Whether it’s a large outdoor project or a small indoor one, Balcom Bros has it all. When your project is done and you want to relax and have a little fun, let us provide you with everything you need to have a great outside party. Celebrate your beautiful home with family and friends and show off all your handy work. Our inventory includes: tents, grills, tables, chairs, bounce houses, dunk tanks, and snow cone, cotton candy and popcorn machines. Everything you need to host the perfect party. Balcom Bros is open all year, even on the coldest of days. We provide and service plows and sanders from brands such as Curtis, Boss, and Torwell. We also provide sand and salt to help keep your pavement clear and safe. Rest assured, we will be there for you 24/7 through snow, sleet, and ice. Balcom Bros will deliver any quantity of materials; anywhere from a single yard of bark mulch to a tractor-trailer full of sand. When your rented equipment is picked up or delivered, our staff will give you instructions on how to operate it safely and efficiently. Hyundai loaders, excavator, comactors and asphault rollers, what you need done we have the tools to do. We have small to medium size available for any household project you may be getting done, rototillers, mini excavators, sod cutters, and more!